When the moths need to rapidly change direction and manoeuvre, for example to escape predators, their eyes are insufficient. Instead, the receptors at the base of the moths' antennae provide the necessary feedback. Researchers from Lund University, in collaboration with Sanjay Sane from the Tata Institute of Fundamental Research, Bangalore, have now explored the role of these antennal sensors for flight control, using the hummingbird hawkmoth (Macroglossum stellatarum) as their study model. In their experiments, the researchers used the moths' natural habit of hovering in front of a flower when they feed on nectar. They trained moths to visit an artificial flower to drink sucrose solution. Then they moved the flower sideways, at different speeds, while filming their responses with a high-speed camera to see how well they were able to follow the flower movements. To understand what role of the antennal sensors, they clipped the antennae, thus blocking the sensory input, and repeated the same experiment. "Without antennae the moths were still able to fly, but they were only able to track the slow flower movements, not the fast ones. When we re-attached the antennae they worked nearly as well as before and the moths were able to track the faster lateral movements again," explains Almut Kelber, professor at the Department of Biology at Lund University. "This is because their antennae function exactly like a gyroscope in aeroplanes. The gyroscope measures the orientation of the plane, or in this case, the moth." When it comes to speed, the compound eyes have no chance of matching the feedback from the moth's "gyroscope." The transduction of sensory information into a nerve impulse takes 1000 times longer for photoreceptors in the eye than for a mechanoreceptor. In addition, the information from the photoreceptors in the eye has to pass a larger number of neuronal connections in the moth's brain before it reaches the muscles that control the wings. This longer chain of command adds to the delay of the visual sense compared to mechanoreception. 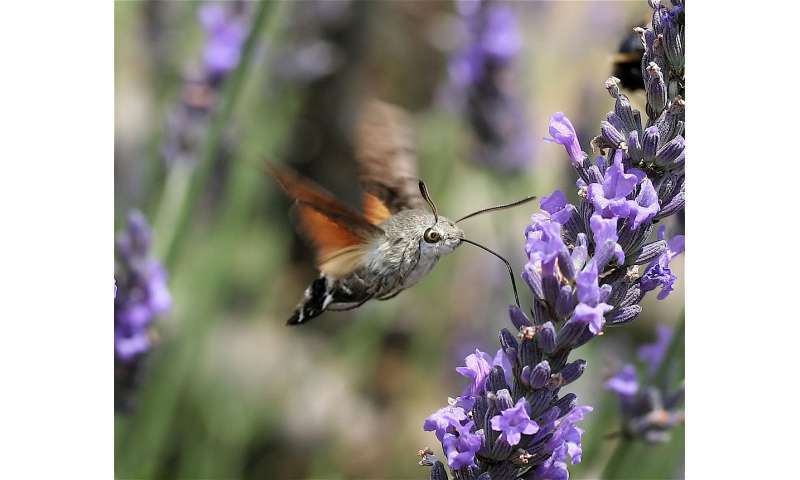 "Until now, researchers have believed that hummingbird hawkmoths only use visual information to navigate. This was only known from nocturnal moths before. We demonstrate that they also use antennal receptors, and showed how they work together with the visual sense," says Almut Kelber. Hawkmoths are not the only insects to use such a "division of labour" between vision and mechanosensation. Flies have long been known to use mechanosensory information from their vestigial hind-wings, small club-shaped structures called halters, in addition to visual information from their eyes. "We showed that flies and hawkmoths use the same strategy to control their flight, despite very different anatomical prerequisites. They use vision for slow movements and the gyroscope for faster movements. Moths do not possess halteres, but their gyroscopes are in their antenna. ", concludes Anna Stöckl, now at the University of Würzburg and one of the researchers behind the study.